Jen Perry at the Warrington Business Awards. 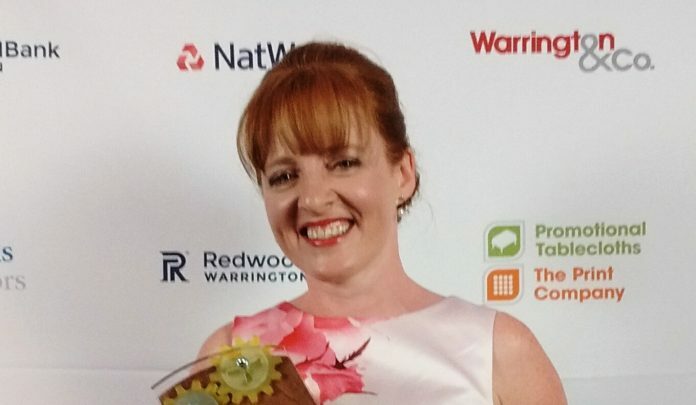 Warrington based mobile afternoon tea and baking school, Room Forty, has been declared Warrington’s Hospitality Provider of the Year at the Warrington Business Awards. The coveted award was announced at a sell-out, glitzy ceremony held at Lymm Rugby Club on Friday 8 June 2018 attended by 460 guests. Room Forty was founded only two years ago by Warrington businesswoman Jen Perry. The business comprises a mobile afternoon tea emporium and baking school. This accolade follows on from founder Jen Perry’s inclusion in Good Taste magazine’s Power List of 100 Women leading the Food & Drink Industry published in April and winning Silver in the Tiptree World Bread Awards in October 2017. The Warrington Business Awards were sponsored by Redwood Bank and Warrington & Co. and were independently judged by a panel of experts.